European Commission Says It Won't Require American Travelers To Get Visas : The Two-Way Responding to a call to end visa-free travel for Americans who want to visit Europe, the EU said progress has been made toward full reciprocity. U.S. citizens who travel to Europe won't have to worry about having a visa requirement reinstated, thanks to a European Commission decision. Here, a sign for Americans returning home is seen at JFK International Airport in New York. The European Commission will not reinstate visa requirements for Americans who want to visit Europe, despite the European Parliament's recent vote to end the preferential treatment over a lack of full visa reciprocity between the U.S. and all members of the European Union. 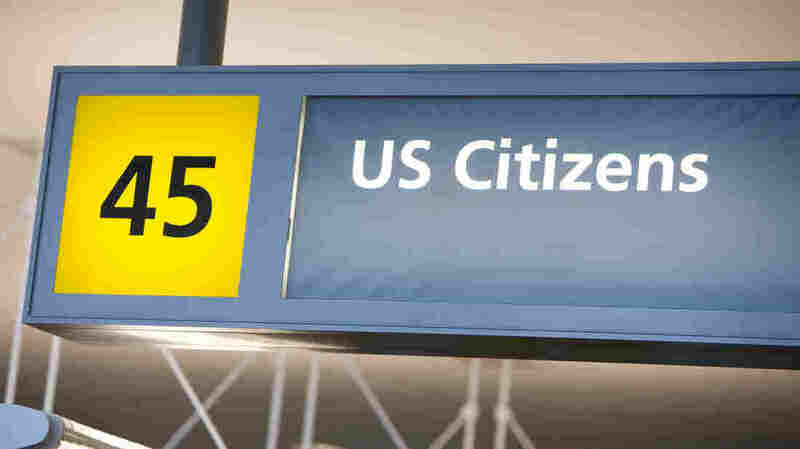 The question was spurred by the U.S. refusal to waive visa requirements for citizens of Bulgaria, Croatia, Cyprus, Poland and Romania, as we reported when the Parliament called for reinstating visas for Americans in March. Explaining its decision, the European Commission said Tuesday that in recent months, "contacts with U.S. interlocutors at the political and technical level were intensified," and the American government has committed to changing its policies once the five countries meet legal requirements. Work on an agreement will continue at the EU-U.S. Justice and Home Affairs Ministerial Meeting that's set for June of this year, the commission says. The European Union "will always choose engagement, commitment and patient diplomacy over unilateral retaliation," the body's commissioner for migration, home affairs and citizenship Dimitris Avramopoulos said via Twitter today. The U.S. wasn't alone in being targeted for potential retribution over its visa policies, being warned to extend full reciprocity along with Canada, Australia, Brunei and Japan. But those other countries have either already resolved the disputes or, in the case of Canada, have set a deadline of December to do so.